Oh, I do love stitching applique - I am making slow progress at the moment, but I am getting there! Beautiful, beautiful repros - I find them very easy to work with, no problem with colour or pattern selection at all. The French General is just lovely to use for the background, not prone to creasing, so that is great. Originally I bought 6 yards, then ordered another 6 - now , as a lot of you know, this fabric doesn't come cheap and I was having serious guilts about buying this when I could have used quilters' muslin, not now though, one of the nicest fabrics I have ever used! My 'Sewing Studio' is messy, messy - how can one keep tidy with such an array of fabrics. Cheers to those patient Girls out there who can use a different fabric for each leaf. Way, way behind with Clamshells - here's the intention! I have fiddled about with the shape and widened it to 3.5". I am using paper shapes with paper that is slightly heavier than the ordinary copy paper and glueing the fabric with the Sewline stick. All seems to be going well, a little early to tell if it is going to be perfectly on the square - hope so as I've always wanted to do a little crib quilt. I'll try to keep it predominately pink with a few other pastels thrown in here and there. Well, I'm out to the shed for a little bit - I need to scrounge for some plastic tubs for storage and there's also some repro bits and pieces out there - happy weekend! Hello Darling! So glad you are getting some stitching done! Looking very good so far... 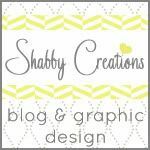 I'm so glad you indulged in some quality fabric for your background - makes a big difference! Hope to see you Tuesday!! Good on you Lurline for buying yourself more of the fabric you enjoy. Your blocks are looking just lovely. Happy to read about you stitching away, the blocks are looking just great Lurline. so your going to use the same background fabric for all the applique blocks? 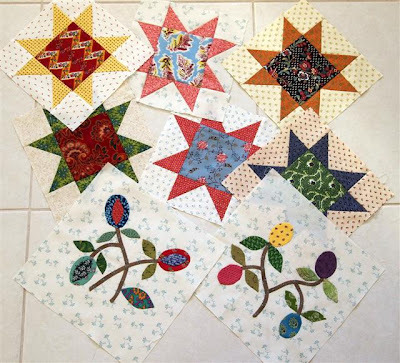 oh I just love the blocks, this quilt will be hard for you to part with! the clamshells look great I still have not started those *yet* tempted but have too many other things right now! The blocks are looking gorgeous, I love the brighter repros you have used. The clamshells are looking very pretty, they are good for a side project. Glad to hear you're getting stitching time in. Oh my! Your Stars and Sprigs start is just gorgeous!!!! Love all the beautiful fabrics -- and I think that French General fabric was a good buy! I love the clamshell start as well! Pretty colors! The applique blocks you are making are just charming. I'm not usually a reproduction fan, but these colors are so clear and bright, not at all drab. Good luck with the clamshells, at least you aren't making a bed quilt -- it looks like that might take a while. Great blocks and i like the beginning of your clamshells. I absolutely love the Sprigs and Stars and would love to make one. Your blocks are looking great! 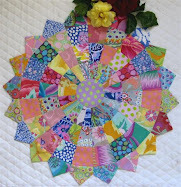 I love your flower blocks, I'm with you and the applique! It's so relaxing. Love the stars, the applique, and the clamshells. I love it when you share your applique! And get rid of those guilts, when you find a good tool it's worth the extra money, and fabric is a tool! Your clamshells look fabulous so far, keep us posted. Everything you show is beautiful Lurline! I would love to try them sometime! It's looking gorgeous Lurline, I love the applique..
Those block are looking amazing. Lovely colours and beautiful background fabric, sometimes plain just isn't right! Hey those clamshells look good in the soft colours. Hey, Look at you go!! Such beautiful work. I am so happy for you! Beautiful fabric combinations. I'm so happy you are able to spend some time doing the things you love. 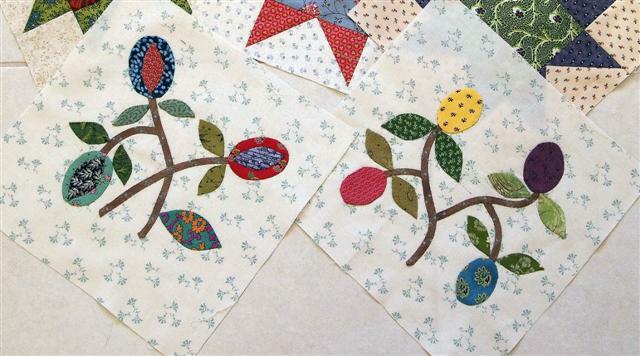 I'm going to try my first applique -- flowers, leaves, stems. Do you have any suggestions? Do you use a product like "WonderUnder to tack on your applique before sewing it down? So Glad to Hear you are Happy Stitching...sounds like things are getting Better for You...Love your Applique & those Clamshells I think could be Addicitve...must give them a Try! Your applique work is stunning and the clam shells are very pretty. 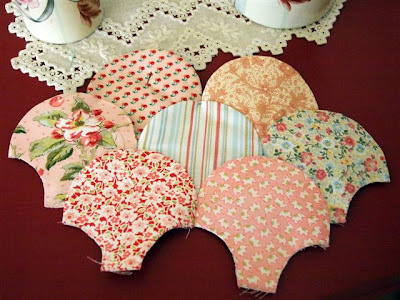 Oh I love your clamshells Lurline ..... all that pinky pastel-ly goodness ..... Mmmmmm :o)!!! Beautiful hand work Lurline - ALL of it!! Thanks for sharing - it's inspirational!! Your fingers have been busy...creating all those lovely blocks! Aren't we so lucky to have access to all those lovely repro fabrics? I love to see them in "action"!! Tienes unos trabajos preciosos desde hoy no te perdere . Beautiful fabrics, great workmanship and you are back to sewing! I hope your health improves everyday Lurline.....your work is such an inspiration to me. I am in awe Lurline of all of the beautiful things that you always have going. You chose of fabric is fabulous. I am loving the French General for the background. I can't wait to see these quilts done.